There are nearly 215,000 women currently serving in the United States military and more than 1.8 million women veterans. Hundreds of thousands of civilian women also serve in combat and post-combat areas as advisors, aid workers, development specialists and health professionals. These women—the special challenges they face during service, their health and wellness, and their perspectives on the relationship between communities and the military —are the subject of a special program celebrating International Women’s Day (IWD), taking place Feb. 26-27. 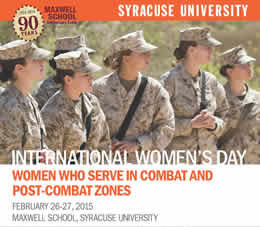 Free and open to the public, IWD is part of the 90th anniversary celebrations of the Maxwell School. IWD is also sponsored by the University’s Institute for Veterans and Military Families (IVMF) and the Veterans Administration Medical Center. Free parking is available for all events in the Irving Avenue garage. IWD will kick off on Thursday, Feb. 26, at 4 p.m. in the Strasser Legacy Room (Room 220) of Eggers Hall with a program titled “VA and Women’s Health: Expanding Horizons.” Mindy Grewal, the women’s health medical director at the Syracuse VA Medical Center, will address a variety of topics, including the role of women’s wellness programs and finding work in the post-9/11 environment. IWD continues on Friday, Feb. 27, with a Maxwell alumni panel featuring Deborah Alexander G’82, G’95, a Washington, D.C.-based social scientist and international affairs consultant; Alexandra Wise ’02, associate director of Shuraako, an NGO operating throughout Somalia; and Lamis Sleiman G’10, a monitoring and evaluation specialist for Management Systems International in Beirut. The alumni panel begins at noon and will also be held in the Strasser Legacy Room. The day concludes with a keynote address by Maj. Gen. Linda Singh, the 29th adjutant general of the Maryland Army National Guard, at 4 p.m. in Maxwell Auditorium. Her remarks, which are expected to address the importance of community and military engagement, will be followed by a light reception. IWD, which is celebrated each year on March 8, was originally proposed in 1910 by Clara Zetkin, leader of the Women’s Office for the Social Democratic Party in Germany, at the second International Conference of Working Women in Copenhagen. The proposal received unanimous assent from more than 100 women representing 17 countries. Since 1975, IWD has been recognized by the United Nations and other multinational organizations. The day marks the economic, political, and social achievements of women all over the world.